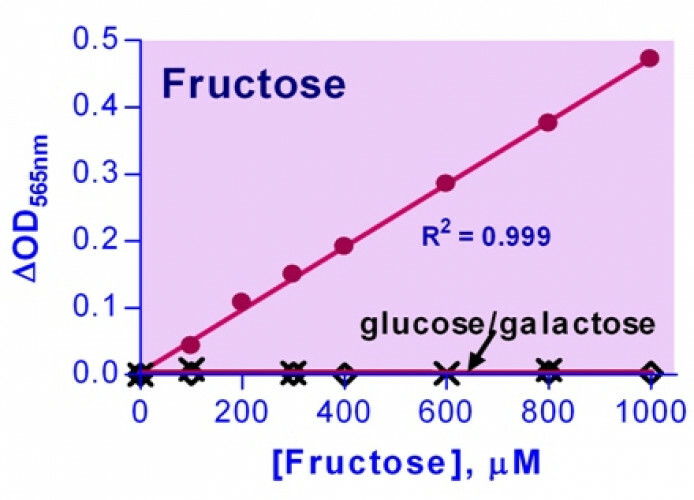 For quantitative determination of fructose and its metabolism. Fructose (C6H12O6, also called levulose or laevulose), is a monosaccharide found in honey, tree fruits, berries, melons, and some root vegetables along with glucose and galactose. The human body can use fructose for energy, however, too much consumption may lead to high triglycerides. Simple, direct and high-throughput assays for fructose determination find wide applications. BioAssay Systems’ reagent systems reacts directly and specifically with fructose to form a colored product. Glucose and galactose do not interfere. The color intensity at 565nm is directly proportional to the fructose concentration in the sample. 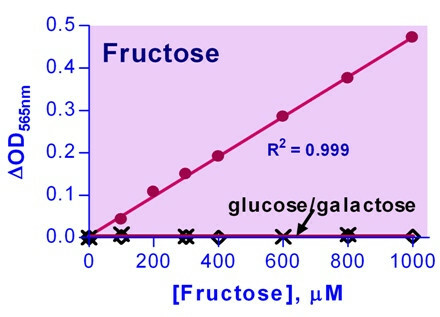 Applications For quantitative determination of fructose and its metabolism. References Assay: Fructose in human serum & plasma (Pubmed).